Welcome to Martha’s Vineyard! There is so much to see and do on the Island, and Martha’s Vineyard Online wants to help you to make the most of your stay. Need ferry schedules? Want to learn more about our six very distinctive Island towns? Looking for the right accommodations for yourself and your family? All that and more is available right here. For even more insider tips before you travel, order the 2019 Martha’s Vineyard Island Guide. This award-winning publication from Martha’s Vineyard Magazine has been completely updated for summer 2019 with local favorites and dozens of things to see and do. Martha’s Vineyard welcomes visitors throughout the year. Come in summer and enjoy our world class beaches, cultural events, fresh seafood, farm fresh produce and laid back lifestyle. Come in the spring or fall and enjoy a host of outdoor activities on the water, in the woods or along the many ponds that ring the Island. In the winter, the Island has its own serene beauty that keeps visitors coming again and again. Whet your appetite for the Island by checking out our restaurant listings and have fun anticipating where you’ll shop, which beaches you’ll frequent and what activities you’ll enjoy. And be sure to check out the Complete Martha’s Vineyard Calendar for the Island’s most comprehensive listing of events. Wishing You a Great Stay on Martha’s Vineyard! 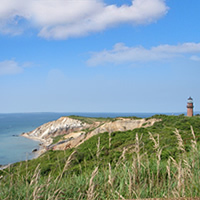 Need to know some basic facts about Martha’s Vineyard? The following information should be able to help you to get a general sense of what to expect in terms of travel resources, Island towns and weather and attractions. You’ve picked out that perfect Martha’s Vineyard accommodation and now you’re planning how to get here. Check out MVOL’s travel options intended to help out even the best navigators. Give yourself the green light for planning your vacation on Martha’s Vineyard! Whether you’re staying one day or many days, in any season, you’ll find following these simple steps for finding your way, staying and playing on the Island is as easy as 1, 2, 3.